Random.org chose a winner (12): Penny! Please e-mail me your address, and your frame will be on its way! 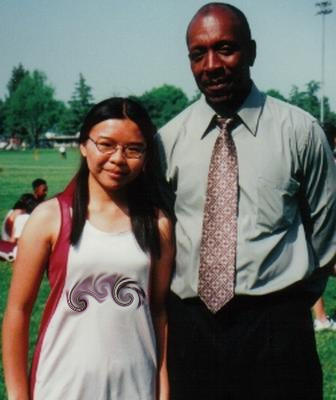 My first public track and field race was the 100 meter hurdles. I wasn't well-trained in hurdling, but they needed bodies and volunteered me since I had the most experience of the lot. Things went pretty fine until I nicked hurdle #7 with my trail (left) leg. Needless to say, hurdles 8-10 were awful after losing my momentum like that, and I had to overcome the voices in my head in order to finish. My first road race was the Laguna Hills (Saddleback) Half-Marathon in 2006. That was nearly five years ago. My first marathon was the Los Angeles Marathon in 2007. I remember how monumental a feat finishing a marathon seemed back then, and I'm a little bit bummed that I will never get that feeling of mystery back. But since I continue to run marathons and can always use the inspiration, I am glad that I was able to memorialize it in this form. The frame can actually hold 3D objects inside (e.g., a baseball). 1) Leave a comment telling me which one of your "firsts" you wish you could preserve (even if it's not possible!). 2) Leave a comment if you already follow my blog, or click "Follow" on the right-hand side to add yourself. 3) Leave a comment with your Twitter handle if you follow me there (@nobel4lit). 4) Tweet or blog about this giveaway and let me know! The Lewibelle Company has created the ultimate in unique for showcasing keepsakes and treasures. 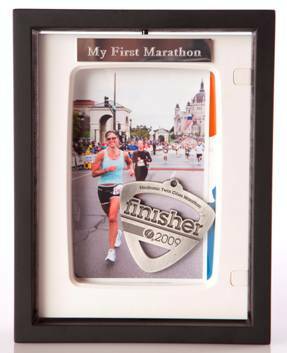 The 3D frames allow you to showcase your most treasured keepsakes and other fun lifetime memories in full 3D, safely protected against dust, moisture and fingerprints. FTC Disclaimer: I was sent a sample and am giving an honest review of the product. I want to document my first Marathon. I will run it in November. I would love to preserve my first half marathon that was 3 weeks ago! All I could think about your track days and doing the 100m hurdles was a video on tosh.0 from earlier this year. I felt so cruel laughing at those girls. As for the first I'd like to preserve. Um, the first time I was proposed to. I know this won't happen again, but I'd like everything about that night (minus my post-marathon soreness) to be preserved in more than photos and words (which we have 'cause we both blog). Hi! I am new and excited to be following you! Those frames are awesome! I would love to preserve my first marathon that I will be running in September. Can't wait! I would love to preserve a picture of my first marathon. That was one of the happiest days of my life. Yeah, I'm crazy behind. But I just had to comment - running a marathon is STILL very monumental. Good luck in Fargo! That is my favorite marathon (out of 11) by far.